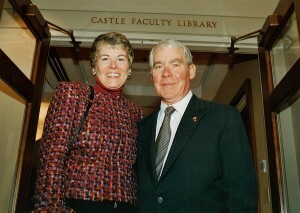 John and Nancy Castles’ support…and love…of NIU have had an immeasurable impact. As volunteers, they are key in moving NIU forward. As leadership donors, they have advanced virtually every university priority. Most of all, John and Nancy Castle are fierce advocates for NIU’s hardworking faculty and students. They are two of the university’s most influential and loyal supporters. John: What’s not to love about NIU? Though I am not an alumnus, my family members have earned five or six master’s degrees from Northern and a Ph.D. My wife, Nancy, is a professor here. My children have benefited greatly from NIU. The community needs this university.